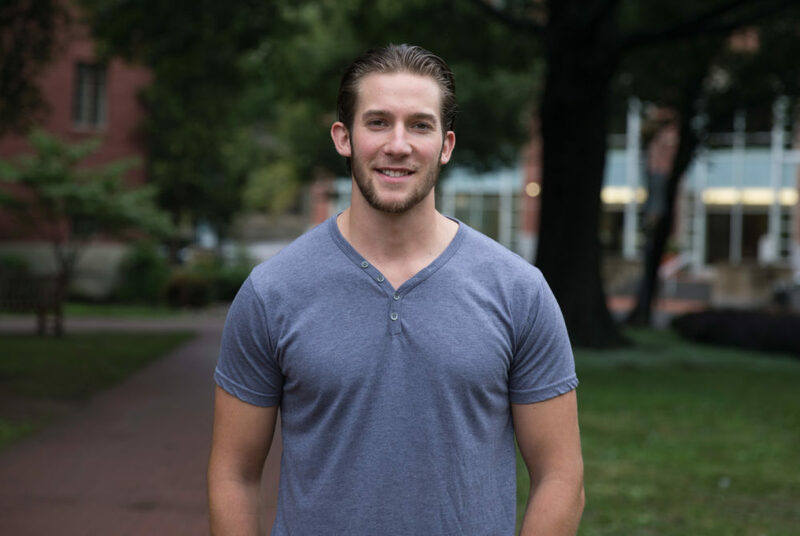 Sophomore Jesse Robinson, the vice president of GW Veterans, said having someone to talk to in class can be a vital resource for veterans who sometimes feel alienated from campus life. Updated: September 6, 2017 at 1:28 p.m. The GW Veterans are stepping up their event programing this academic year to build closer connections between student veterans and more traditional students. Tyler McManus, the president of GW Veterans, said an increase in funding from the Student Association allowed the group to plan about 60 events for the fall, compared to about 40 events a year ago. Many of the events will be organized with other student organizations to allow student veterans – who are typically older than most undergraduates – to feel more apart of the campus culture, McManus said. Last spring the SA tapped into unspent funds from previous years, giving the finance committee a roughly $300,000 increase in the amount of money it doles out to student groups and setting aside more for co-sponsorships given throughout the year. GW Veterans was given $4,500 from this fiscal year, according to the SA’s budget – more than double it’s allocation from a year ago. McManus said he wants to bring groups together for events on campus with differing perspectives, like the GW College Democrats and the GW College Republicans, because veterans at GW hold a wide range of political perspectives, though the organization is officially nonpartisan. He said student veterans want to play a role in bridging the political divide on campus. The events will help build relationships between student veterans and more traditional students that will be beneficial to both groups, McManus said. Veterans have traveled all over the world and have a lot of life experience and skills to offer other students, he said. While younger, more traditional students can potentially help veterans with school work or adjusting to life on campus, McManus added. Sophomore Jesse Robinson, the vice president of GW Veterans, said having someone to talk to in class can be a vital for veterans who can sometimes feel alienated from campus life. Robinson said he didn’t know anyone when he moved to D.C. last August for his first year at GW. He commuted from Arlington, Va. and rarely came to campus for anything other than class, he said. Graduate student Tommy Elms, the former vice president of GW Veterans, said after a heavy focus on internal projects for student veterans, like getting their own resource center on F Street, the group can now shift to a more outward-looking perspective and work on getting its membership more involved in campus student life. Jazmin Kay, the president of the GW College Democrats, said the group is reaching out to GW Vets and GW College Republicans to plan a community service event on Veterans Day. Kay said the organization also plans to be involved with the 9/11 Vigil and Remembrance event, which groups like GW Veterans, Sigma Delta Tau and GW Women in International Security will co-host, according to a Facebook event. “I think that right now politics is something that affects everyone’s daily lives, and I think that especially engaging with veterans who bring such a unique experience and also commitment to public service is a really, really natural partnership,” Kay said. The GW Veterans plan to partner with the GW Republicans during the fall semester but have not yet announced an event. Sara Dougherty, the director of public relations for the GW Republicans, said the group will be involved in the Veteran’s Day event and plans to be involved in veteran advocacy. “Veterans do not all have the same opinions about how they can best be supported, so it is important that our two parties work together to support our veterans,” Dougherty said in an email. The Hatchet incorrectly reported that Jazmin Kay said GW Veterans, Sigma Delta Tau and GW Women in International Security will co-host the 9/11 Vigil and Remembrance. Those organizations are listed on a Facebook event promoting the vigil. We regret this error.